This week I have been getting ready for a camping weekend. The weatherman said it was going to be a beautiful weekend, and now they are talking a rain shower and rain on monday, wish they would make up their minds. We do need to test the trailer and make sure everything is working ok and I have had a rough week, so a few days of resting, will be good for me. I wanted something to work on at camp, that is simple and keeps my hands busy. I decided on a baby quilt, I made years ago. It is not perfect, and I went with a lot of black, so I am just going to do a prim black stitch on it. 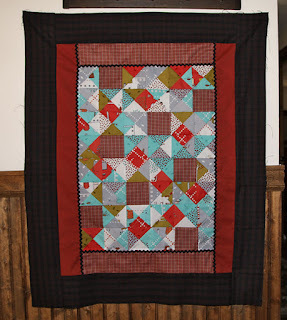 I may do hearts in the larger dark red squares. 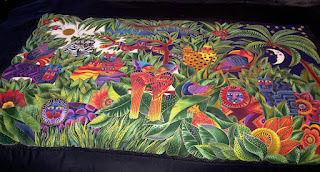 Another quilt I had forgotten about was this Laurel Burch panel. I guess I was hand stitching it and planning on making it into a wall hanging. Now I am wondering about that. I didn't do too much stitching yet, so I could take out what I did and redo it. I was thinking about a quilt, but then I thought, what if I kept the panel and made a giant bed pillow. I could use it on the side of the guest bed, to make it into a day couch. Any ideas? The panel is 42" x 23". And one reason why I felt horrid this week, I killed my back, going glass hunting. I overdid it and did way too much bending, so I need to take a break, lol. At least the camp beaches are more fun to walk and enjoy the views, not much glass on rocky beaches, it usually breaks up into sand. I did get some nice pieces, though. Last weekend was a hard-on-the-back one for me too. I set up washing tables for each meal so the boys could wash their mess kits there rather than in the latrine. Six heavy buckets of hot water carried out to the picnic area for each meal was more than I needed. Be sure to get in some rest time this weekend. I understand about the back pain; my shoulders, back and hips have been in constant pain since I'm continuing to drag heavy limbs into the woods. Until these trees are totally gone will be in pain. No Aspercreme nor Biofreeze seems to help. My star quilt is still a UFO. I don't picture you doing anything with Laurel Burch. Her fabrics were very popular at one time. 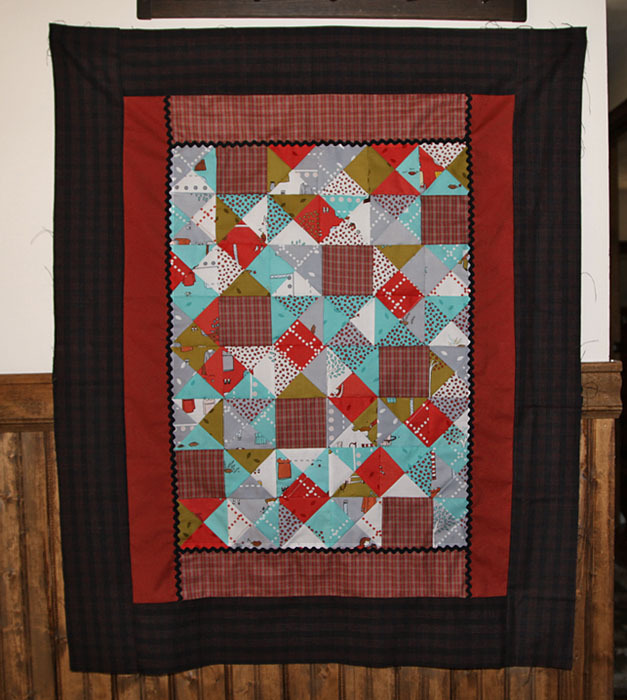 Lovely baby quilt, the Laurel Burch piece would make a pretty wall hanging or a nice bright pillow. 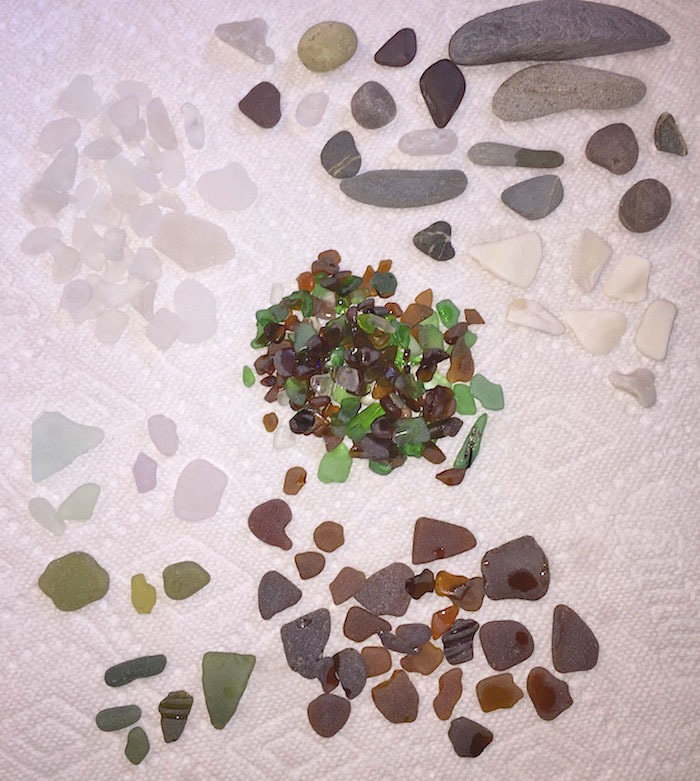 Nice collection of sea glass. Your LB panel would make a fun pillow to use for extra floor seating or lounging as well. How about doing something with your beach glass for awhile? Do you have a tumbler? They can be easily made into pretty jewelry or coasters and such, giving a nice beach touch. Take care of yourself first. That is a darling quilt!! I do like the idea of turning that panel into a large pillow, you can never have too many pillows. I hope your back feels better soon - that's no fun!